Laddie Williams likes to tell the story about how a good friend and former business partner used to be “real negative” about Calhoun-Liberty Hospital in Blountstown, Fla. But after Williams' friend suffered a stroke in 2009 and was whisked by ambulance to the hospital, his attitude changed. “I went to see him and he said, 'Laddie, that hospital saved my life.' Now he is a big supporter,” Williams says. Williams, 75, who has been chairman for 20 of the 23 years he has served on Calhoun-Liberty's board, has reason to be proud. The facility went from nearly shutting down permanently in December 2005 to prospering in 2009 as a 25-bed critical-access hospital located between Panama City and Tallahassee. The numbers tell the story. Calhoun-Liberty Hospital averaged only five to six inpatients per day in 2006 compared with 10 inpatients per day last year, says Ronald Gilliard, the hospital's CEO and administrator. During the same period, the hospital's financial performance also improved from a $10,000 loss on revenue of $8.9 million in 2006 to a profit of $1 million on revenue of nearly $22 million in 2009. 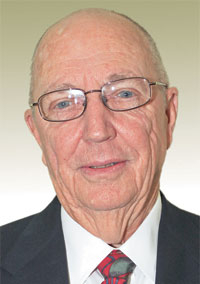 For his accomplishments, Williams has been chosen as the 2010 Trustee of the Year for small healthcare organizations—those with less than $75 million in annual revenue or fewer than 250 beds. As a former mayor, city councilman and Calhoun County Chamber of Commerce president, Williams has always believed that the hospital is simply too important to fail. The hospital's turnaround began in December 2005 after the Calhoun-Liberty Hospital board gained control of the not-for-profit facility from DasSee Community Health Systems, Quincy, Fla. DasSee—a for-profit that had leased the hospital since 1996—surrendered control of day-to-day management after it couldn't meet payroll and other operating expenses. The board then scrambled to keep the hospital open. To fund operations, the board raised cash in 2006 from a variety of sources: $1 million in accrued lease payments from DasSee, a $350,000 grant from Calhoun County and a $600,000 low-interest loan from the state. And Williams, in concert with elected representatives, persuaded state regulators to forgive $650,000 in payments that DasSee hadn't paid to Florida's indigent-care pool. Lack of cash wasn't the only problem. The hospital had a reputation as a low-quality provider because its appearance was shabby and equipment was old. The board attacked the quality problem on several fronts. First, it expanded the number of voting members on the board from three to eight, adding new members with pertinent professional backgrounds, such as in accounting and government. It also hired Gilliard, a veteran hospital administrator, from 35-bed Evans Memorial Hospital in Claxton, Ga., in June 2007. To boost staff morale, the board returned health insurance to the employees' compensation package in 2007. The benefits had been axed under DasSee's management. A $50,000 loan and a $45,000 grant from the U.S. Department of Agriculture in 2007 to upgrade the financial information system. A $400,000 loan and a $112,000 grant from the USDA in 2008 to purchase medical equipment, including a portable X-ray unit, ultrasound devices, lab equipment, a heating and air-conditioning system, inpatient beds and stretchers. Some $120,000 in contributions came from local residents, clubs, churches and businesses to remodel inpatient rooms, the nurses' station, cafeteria and chapel. The most ambitious project may have been the installation in 2009 of a $400,000 electronic health-record system. The system was funded with a $100,000 capital-improvement grant from the state as well as a one-year installment payment plan from the vendor. The changes not only attracted patients but physicians as well. When the board took over management of Calhoun-Liberty, only two of the town's four physicians admitted patients to the hospital. After the changes, the two estranged physicians not only began admitting patients there but have also recruited a third partner for their practice. In Williams' mind, the countless hours he has invested in the turnaround are worth it. “People don't think about what we got until they have a stroke or a heart attack or an accident. In the last three years, we've saved two lives from snake bites,” he says.